A foundation of IPM in urban landscapes is to put the right plant in the right place. This reduces plant stress and thus the long term costs of pest management. Many urban trees have more pests than the same tree species in natural areas. This is due in part to the stress created by impervious surfaces such as roads and sidewalks. Impervious surfaces increase air temperature, reduce soil moisture and oxygen, and increase soil compaction. We have found that impervious surface cover is linked to red maple condition and scale insect infestations. Maple trees (Acer spp.) are the most commonly planted genus of landscape trees in the eastern US. The most common maple species planted in southeastern landscapes is red maple (Acer rubrum). Red maple is a bottomland species native throughout eastern North America. It has characteristic red petioles, flowers, and brilliant red foliage in the fall. The most important insect pest of red maples in the southeastern US is the gloomy scale, Melanaspis tenebricosa (Hemiptera: Diaspididae). 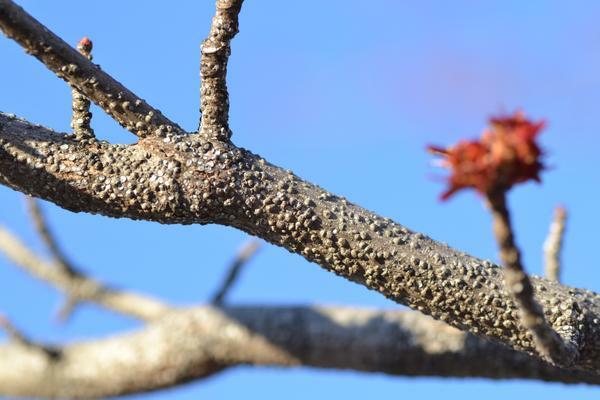 This native armored scale insect is distributed throughout the southeastern and mid Atlantic states. Gloomy scales insert their mouthparts through tree bark to feed on fluids within the trunk and branches. These insects are small, obscure, and produce an armored covering that protects them from the environment and most control methods. Therefore, pest management with conventional tactics is difficult and often unsuccessful. Red maple branch covered in gloomy scales. Increasing impervious surface cover around trees makes them hotter and more drought stressed. Research has found that gloomy scales are up to 200 times more abundant on red maple trees in the hottest urban sites of Raleigh, NC than nearby sites just 2-3°C cooler. The combination of heat, drought stress, and high gloomy scale abundance reduces red maple growth and condition. Tree condition is a standard rating given to urban trees based on tree form, canopy density, branch dieback, and other features. The conditions, in order, are: poor, fair, good, and excellent. As tree conditon declines tree services such as photosynthesis, cooling, and aesthetic enhancement also decline. Impervious surface cover within a 25m radius around a tree or planting site can be used to predict gloomy scale abundance and red maple condition. Arborists rate tree condition as poor, fair, good, or excellent. Impervious surface cover can be measured from satellite images with software such as ArcGIS or by using the Pace to Plant technique. In IPM, thresholds are established points at which management decisions can be made to reduce pest damage and economic loss. Since impervious surface cover is related to scale insect abundance and tree condition, we developed impervious surface thresholds to guide planting and management decisions. Trees surrounded by < 33% impervious surface cover (at 25 m) will most likely be in good or excellent condition. Trees surrounded by 33% - 66% are likely to be in fair condition. Trees surrounded by 67% or more tend to be in poor condition. 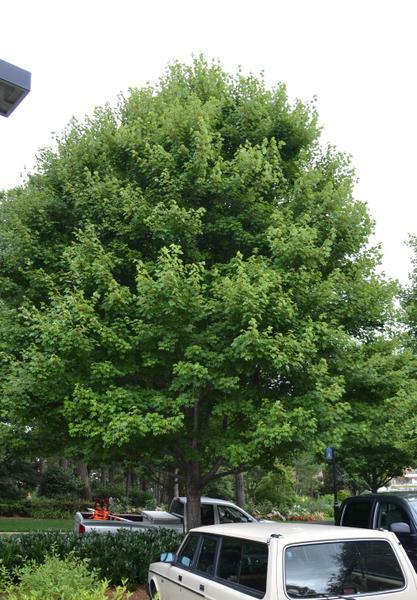 Landscape architects, urban planners, arborists, landscapers, and other tree care professionals can use these impervious surface thresholds to reduce red maple management and replacement costs. Trees with less than 33% impervious surface cover surrounding them at 25 m tend to be in good or excellent condition. Trees will have a full, dense canopy and grow quickly. Typical sites are set back from roads in lawns. 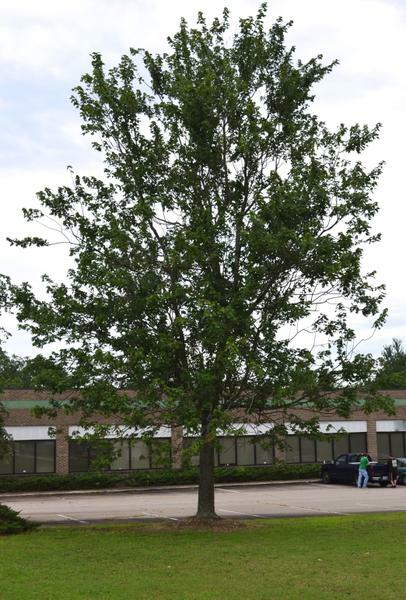 A tree in excellent condition with a full canopy, no dead branches, and few scales. Trees surrounded by 33 – 62% impervious surface tend to be in fair condition with a sparser canopy than excellent trees and some bare or dead twigs. These tree usually have moderate to high gloomy scale infestations. Typical sites may have a tree with roads on one side and large areas of grass or landscaping on the other. A tree in fair condition with some dead or bare branches and sparse canopy. 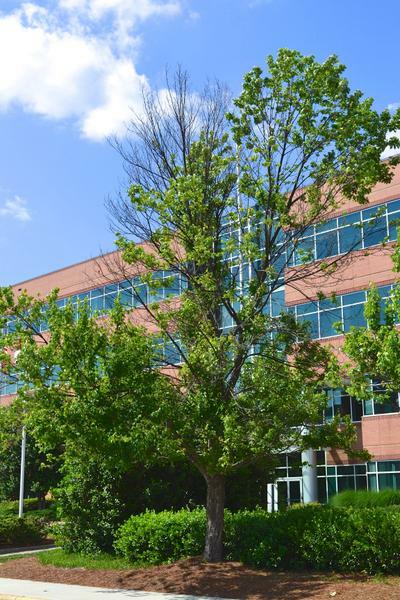 Trees surrounded by more than 62% impervious surface are usually in poor condition with sparse canopy many bare or dead branches, and unappealing shape. These trees usually have high gloomy scale infestations. A tree in poor condition with many dead branches and noticable scale infestation.